We are anchored out in Tavernier, Florida. We could easily spend all of our time working on our boat – cleaning, fixing and maintaining it. But, we’ve got homeschooling to do. I have never homeschooled our children. 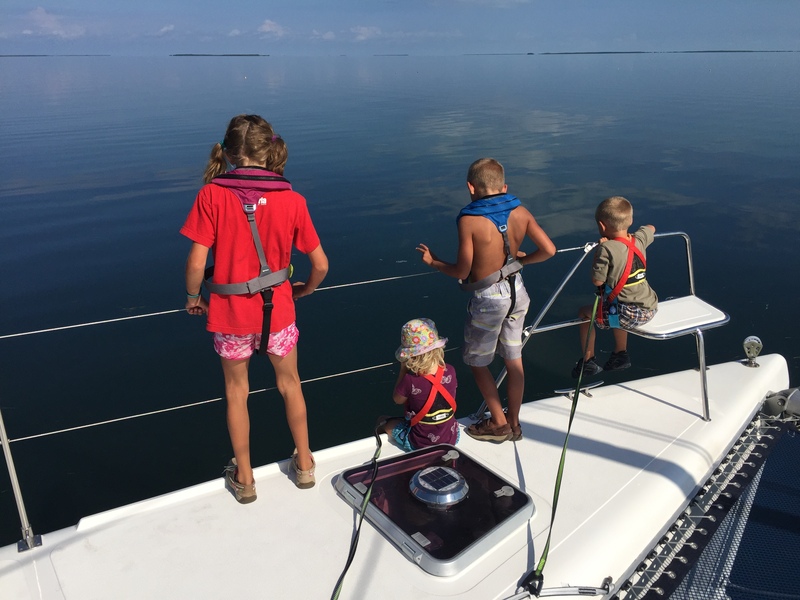 Yet, as part of our liveaboard adventure, we are committed to teaching kindergarten, grade 2 and grade 5. Let me introduce you to our students. 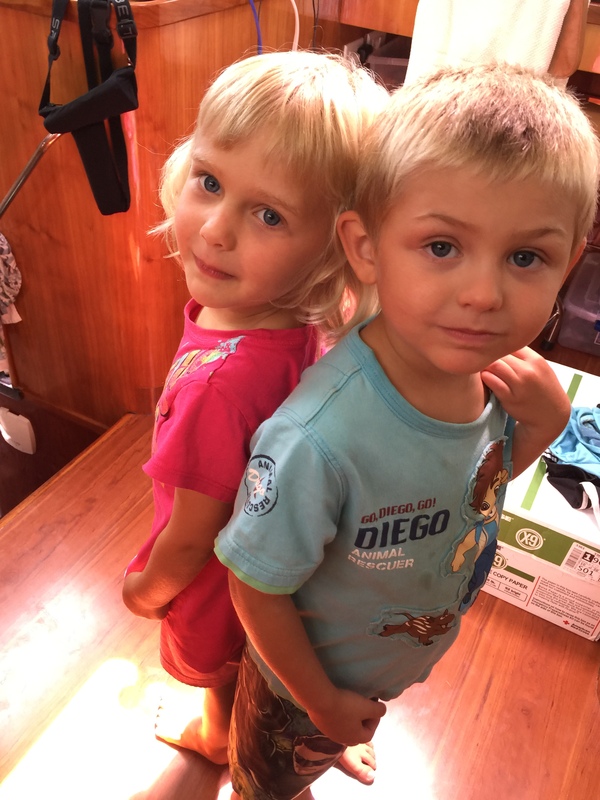 First, we have our kindergarten students – twins, Henry and Karen. They are four years old. Henry and Karen standing back-to-back to see who is tallest. “A is for Pig” is a quote from Karen who is learning her letters. Karen is fascinated by animals, and skeletons. She enjoys drawing mermaids in great, anatomically-correct detail. Here is a picture I took of the first time she wrote her own name. 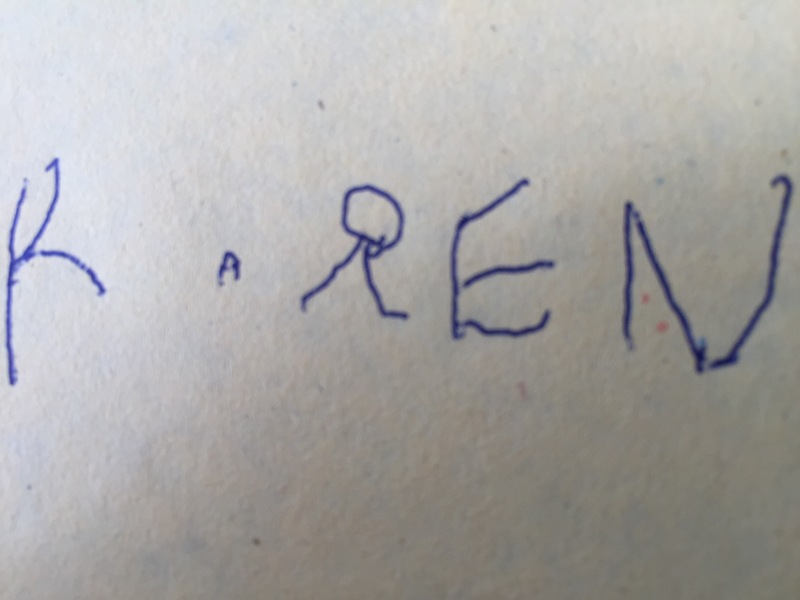 Four year-old Karen spells her name for the first time. Henry is very interested in how things work. I’ve seen him lie on his tummy and pretend to apply gel coat, which is the special paint that is used on our boat. He begged my husband, Rick, to make him a generator using Lego. Next, we have our grade 2 student, Paul. 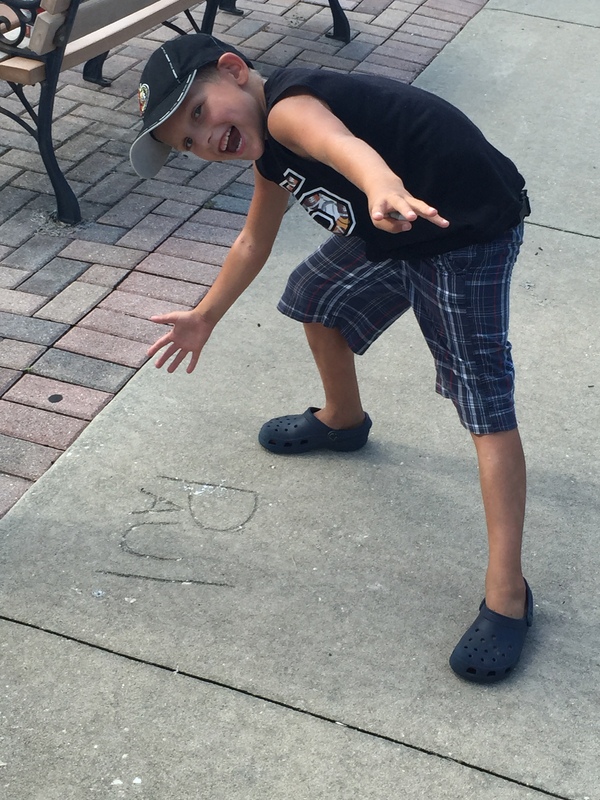 Paul, age 7, found his name on a sidewalk near the Palmetto Branch Library (Palmetto, Florida). Paul is practicing reading, and enjoys playing games on the iPad, some of which are school related. Finally, we have Betty who is nine years old. She is in grade 5. Betty with her dad (Rick). In this picture, Betty is holding a book. This is fitting because Betty is an avid reader. She is a wonderful artist, and recently wrote an essay on animals in the Bahamas. The Bahamas will be our first stop outside US waters. Launching into Canada’s Ontario curriculum, with no prior teaching experience, has been like meeting a school matron with a big stick. There are so many guidelines to follow. And, it is intimidating. But, curriculum guidelines aside, our personal, family goal is to provide our children with a solid foundation that will carry them through life and university. With that family goal in mind, I picture a one-roomed schoolhouse with a teacher, perhaps barely out of school herself, patiently teaching to children with slates. And I think to myself, I can do this. We have sketchy Internet access and limited access to libraries. Our children do not always listen or participate with rapt attention. 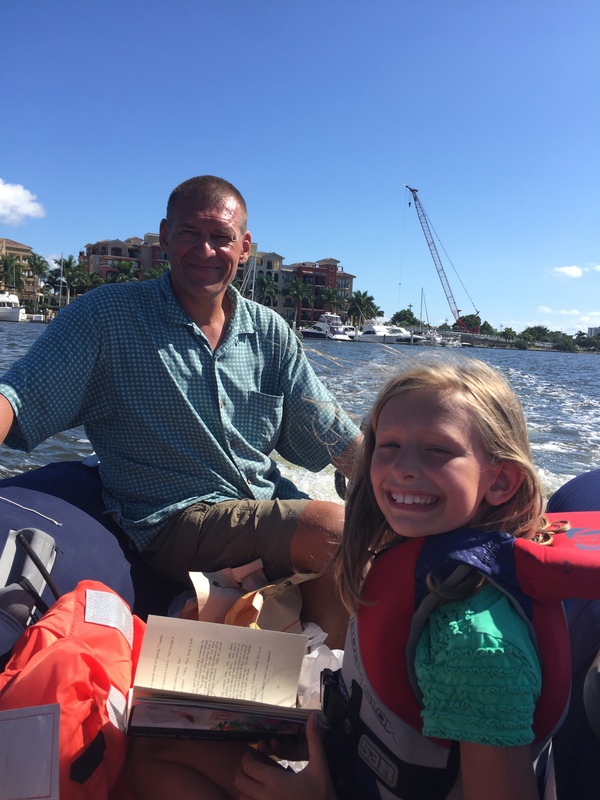 However, we are keen to teach, provide unpopular boat cleaning as a homeschooling alternative, and have many homeschooling materials. In my short time in my new role as teacher I have learned one valuable lesson. That is, that I need to teach at their level. We’ll leave the “cultural impact of slavery on modern-day Bahamas” topic for another day. Teaching in a way that is accessible to my kids has several benefits – they learn to something and I gain a closer connection to my children. Betty, Karen, Paul and Henry looking for jelly fish on SV Aphrodite. Jonathan says: A is for pomme! We are definitely raising bilingual children. 🙂 Good luck with teaching the curriculum.